A former Information Minister, Fritz Baffour has endorsed Alban Sumana Kingsford Bagbin as the best candidate to represent the National Democratic Congress (NDC) in the 2020 presidential elections. Fritz Baffour has boldly declared the Second Deputy Speaker of Parliament as his choice and also made known his intention to support him in his bid to be elected as flagbearer of the party in the upcoming primaries. 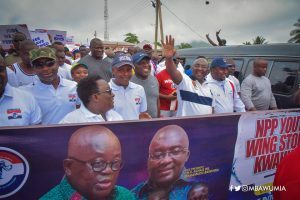 The leading member of the NDC said, his love for Ghana has influenced his decision to opt for Alban Bagbin, who he described as a friend and colleague, as the best among the others aspiring to be flagbearers of the party. He further pledged his commitment in campaigning for Alban Bagbin, to ensure his dream to lead the NDC and become Ghana’s president, becomes a reality. His statement reads: "Hello folks, I hope all is well. I just want to say that I love Ghana, so I do not have the luxury of standing on the sidelines when it comes to stepping into the breach. I have decided to work extremely hard to get a friend and colleague elected as flag bearer of the NDC. It will not be easy but to borrow from the motto of the vaunted British SAS..'Who dares wins ' I'm opting for Alban Bagbin! I'm going to be extremely busy pushing the envelope for the next few weeks so pardon my occasional absence. God bless Ghana!" Alban Sumana Bagbin is in the NDC Presidential race with former President John Dramani Mahama, Ekwow Spio-Garbrah, Prof. Joshua Alabi, Sylvester Mensah, Rickett Kwaku Hagan, and Augustus Goosie Tanoh.